Holy Basil, also known as, Tulsi or the Queen of Herbs is a powerful and spiritual herb beneficial to your health and peace of mind. In fact, Holy Basil has three varieties that in taste are unique on their own, however; the medicinal properties performed have similar functions. Vana, which has a lemony citrus flavour. Krishna has more of the spicy tones. Rama has a depth to the taste that brings on that calmness in its flavour. More on these three blends later. Unlike its relative Sweet Basil, which is more popular in culinary dishes, Holy Basil or Tulsi, focuses mainly on the healing and medicinal benefits that have shown to have antibacterial, anti-fungal and anti-inflammatory properties among many other benefits this Queen of Herbs has. Tulsi the Holy Basil of the Hindus. For thousands of years, Holy Basil a powerful herbal remedy has been used for many ailments within the Ancient Indian Ayurveda forms of healing. Within the Hindus religion, Holy Basil is a highly worshipped that has become a spiritual symbol. 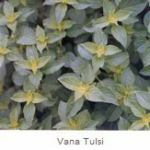 According to mythology, this herb is the incarnation of the goddess Tulsi that offers divine protection. 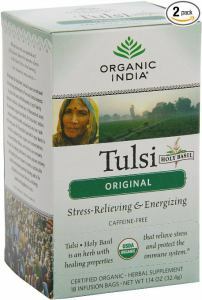 This is where the name Tulsi originated and why the name used is revered among the many within the Hindu religion. You will find many Indian families will have this herb growing within their homes many of whom worship and send blessing day and night. Although Holy Basil is worship and revered in many Indian families as a spiritual symbol, it also has great healing and health benefits for many ailments in life. Adaptogen, the main benefit and most widely accepted property of Holy Basil. Adaptogens help to balance, strengthen, and improve resistance to many forms of physiological or mental stress along with helping to reduce Anxiety. Such herbs that contain Adaptogens such as Holy Basil do not alter the mood but rather help the body function at optimal levels during those times of stress and difficulty. By helping, the various issues with anxiety, depression, and stress. This also has a flow-on effect with other issues in health that have formed due to the above conditions either directly or indirectly. Such examples can be in the reduction of Blood sugar levels, which will greatly help those who suffer from Diabetes. As the blood sugar can be lowered this can also help reduce cravings again in turn possibility helping those with weight loss. More research can support this but logic suggests that eating healthy and more beneficial foods will greatly aid and assist weight loss more than going on Fad or those Yo-yo diets. There are strong anti-bacterial properties within this amazing herb. Benefits have shown that it helps to protect against pathogens that have become resistant to antibiotics. It protects the cells from free radicals known to invade and cause damage to the cells of the body. As an oil, Holy basil along with its cousin Sweet Basil both help with the treatment of various skin issues that have been found suitable for example in the treatment of acne. 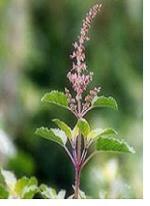 One of the best ways to take Holy Basil is in the form of an Herbal Tea or as a supplement. The leaves and the blossoms of the plant are used in the preparations of the tea. Taking the tea will not only help with many of the issues mentions above such as helping to reduce stress etc. but it can also help with fighting Fever and the Common cold. Reap the greatest benefit by using all three forms of Tulsi as each variety has a slightly different look and taste as mentioned towards the beginning of this article. It may not be possible to find or obtain all of the various varieties of Holy Basil, however, I have found that Amazon, have a wonderful organic tea that includes all three forms. Along with the supplements, further below. While the supplements also contain the three varieties as found in the tea mention above. They can offer the same benefits as in the tea forms but for some may find that taking capsules may be more convenient depending on where and what you are doing. You may not always be in a place to take the tea so the capsules can come in very handy. 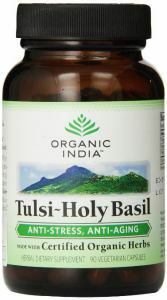 You can always try to purchase organic ten and the supplements containing Holy Basil from many health stores. However, if you are having difficulty in finding the tea or supplement, I have found some links within Amazon that are available for you. You can have it delivered as well. Besides the last thing, you would want to be doing when with the flu or cold or even suffering from Anxiety is to go outside and go shopping. Crowds and people are not what is needed at this stage but peace and security. Have a look at these selections from Amazon where should you wish to do so can order direct and have your chosen items sent to you. You may find other benefits there for you as well not just herbs but many other options most beneficial to your piece of mind. What better place to receive your herbs than from the Holy Mountain itself. Remember the powerful adaptogens and anti-bacterial properties, help to fight against many invasions within the body. It helps to fight against stress, anxiety, and depression along with many more benefits this herb has to offer. Whether you call this herb Holy Basil, Tulsi or The Queen of Herbs regardless of the name you choose. Herbs, spices, and many other options can only take you so far in helping to improve your health both physically, mentally, emotionally or spiritually. To obtain optimal benefits in life, a balance of all four quadrants is most beneficial. In saying so you are in control of your pathway and only you can go forward. Wishing you much success in your life sending blessing from the heart.